Liberals are always featuring education as the key to the future of America. Its an easy sell. We all want our kids to have a good education. But when a liberal is promoting education, he is not likely on the same page as the rest of us. The liberal is not necessarily thinking about reading, writing and arithmetic, unless it is in the context of how to conduct social engineering through those subjects. Reading, for example, might be learning how to read or how to analyze great literary works written by Marxists. Writing might be learning how to properly extol the virtues of socialism. And math might be like how our government does it - spending yourself into oblivion so you can be dependent on the government. There are several examples of what is happening in education that have been reported this week. 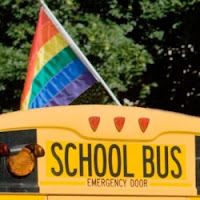 The California legislature has passed a bill making it mandatory for public schools to teach homosexual history, specifically the "Fair Education Act." Elevating the homosexual lifestyle to the minority status of African Americans, Hispanics and Native Americans, California lawmakers are forcing schools to teach about lesbian, gay, bisexual and transgendered people's contribution to history and society. One legislator objected saying that the law promotes the homosexual agenda by teaching kids that the lifestyle is good. This could spread across America in standard textbooks. Blaming poor decisions on budget cuts, Illinois will no longer test students on their writing skills during standardized exams every spring. According to AP, Oregon and Missouri also decided to cut out writing exams. Illinois Schools Superintendent Christopher Koch told the Chicago Tribune that Illinois was trying to minimize the damage of budget cuts and since the federal government does not pay for the writing testing, it was sacrificed. Koch is saying, however, that advanced placement students will be tested in writing, and others will be tested in the college entrance exams. One teacher summed it up for AP, saying that not having to focus on writing tests "offers some freedom." It also offers taxpayers and parents insight that they need to take greater care in knowing what goes on at their children's schools. Some 41 states, for example, have adopted the new Common Core Standards for English which does not require cursive writing. With all their millions of dollars from property taxes, one would think that we could get more out of our public schools than kids that know homosexual history but cannot sign their name. Jesus said in Luke 17:2, "It were better for him that a millstone were hanged about his neck and he cast into the sea, than that he should offend (meaning entice to sin or scandalize) one of these little ones." We need to raise our voices because ultimately we are responsible for our children.